Valentine's Day getaway dates are still available!!! Message to inquire about our Valentine's Day Package! From the breathtaking panoramic views to our stunning architecture and world class amenities, Chateau Selah is a unique combination of the best our region has to offer. The Luxurious Chateau Selah was ideally placed atop 82 acres of land to realize a 360 degree view of the surrounding mountains that is breathtaking. It has the feel of something vibrant and ancient, as you crest the hill to the home, leaving the rest of the world to drop away. 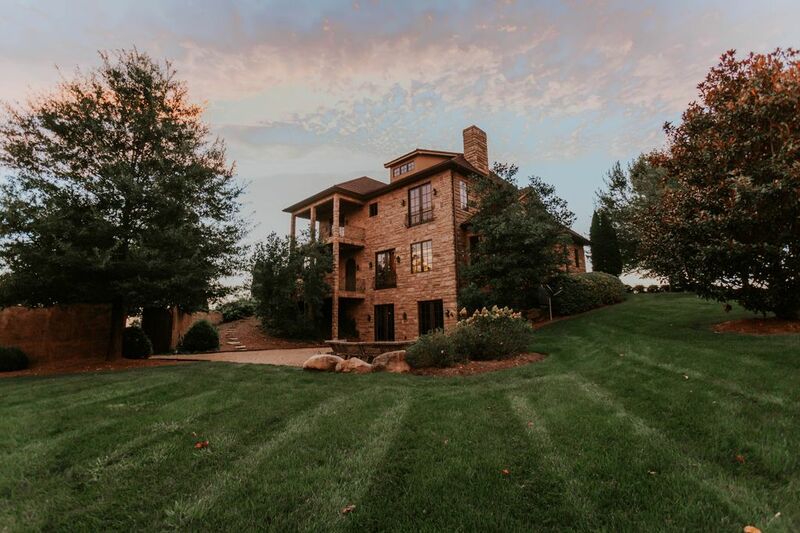 Upon arriving, the Chateau sits before you with the look of stoic grace, beautifully landscaped, and surrounded by mountainous horizons that on a clear day afford you views from Bay's Mountain to Roan Mountain and beyond. The beautiful re-creation of the Old-World, complete with stone walls, wrought iron chandeliers and railings, and fire pits, is infused with modern luxury. Heated tiles in the bathrooms, prep table, 4 ovens (2 convection) and 2 ranges, sound system on a 120inch projection screen in the theatre room and much more! We are conveniently located just minutes from I-81 in the Tri-Cities, TN and 3 miles from Tri-Cities Regional Airport. Located on the bottom floor of the house we have our Theatre Lounge with ample seating on our couches and chairs. In this room we have a 120inch projection screen with a built in sound system. Full kitchen equipped with one large refrigerator, a prep table, four ovens (two convection), two gas ranges, coffee marker, wine cooler, silverware and pots and pans. Everything was great! Kelly was absolutely fantastic to work with!